Virtual reality (VR) is an artificial environment that is created with software and presented to the user in such a way that the user suspends belief and accepts it as a real environment. One form of virtual reality is a 3D image that can be explored interactively at a personal computer or by wearing a device. Further options involve wrap around screens and devices that give the illusion of touching the images. 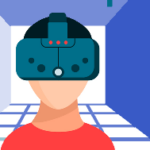 Virtual reality has the potential to revolutionize employee training by allowing the user to experience the training rather than read a manual. Unlike Virtual Reality, Augmented reality (AR) does not replace the user's current environment, but enhances, modifies, or 'augments' that the current, physical, real-world environment overlaying additional elements to the surrounding environment using computer-generated sensory input such as sound, video, graphics, or GPs data. The advantage of AR is that trainees can receive hands-on experience in real-world scenarios in a safe manner that enhances memory retention without disrupting production line. 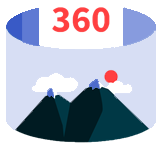 360° videos, also known as immersive videos or spherical videos, are audiovisual recordings where a view in every direction is recorded at the same time. During playback, the viewer experiences a substituted environment that surrounds him, allowing him to look around them in all directions, just as they can in real life. In addition to live and previously captured video, 360° VR may include pre-rendered computer graphics imagery. The 360° video enhances training performed in a physical environment such as pilot and driver training, surgery, undersea and space exploration training.